On 3 November the church and monastery were assaulted by officers and activists who invaded the yard, smashed the door and insulted Redemptorists. Attack an attempt to bend the will of religious for the resistance to the expropriation of the land of another parish. Hanoi (AsiaNews) - The Archdiocese of Hanoi "condemns the barbaric and illegal actions of those who have violated the courtyard of the monastery and the parish of Thai Ha with offensive and provocative words of a violent nature." The Church of Hanoi was reacting to the attack of November 3, when hundreds of police and military accompanied by dogs and thugs and followed by a state TV crew attacked the monastery, shouted insults with megaphones, threw stones and smashed the front door. At the time Father John Luu Ngoc Quynh, Brother Vincent Vu Van Bang, and brother Nguyen Van Tang were among those who were verbally and physically attacked when they tried to stop the thugs who were smashing the door of the monastery. Father Pham Xuan Loc was attacked in the monastery as he tried to stop their unholy acts. To put an end to the assault thousands of Catholics rushed from neighboring parishes, called by the bells of the Thai Ha church. The background to the raid is probably the desire of local authorities to bend the resistance of the Redemptorists who oppose a new expropriation of part of the parish grounds. 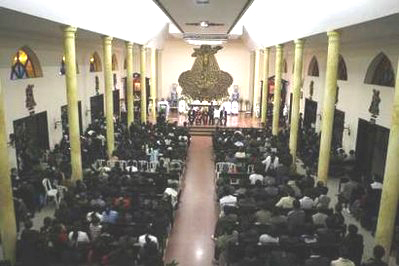 The story began on 8 October, when the parish priest, Father Joseph Nguyen Van Phuong, was summoned to the headquarters of the district People's Committee of Dong Da and informed that a plant for the treatment of wastewater from the hospital in the area will be built on land belonging to the Redemptorists – who have run the parish since its founding in 1928. The priest responded asking them to abandon the project and return the land that has already been expropriated to the parish. The reference is to what events that occurred between 2008 and 2009, when the Thai Ha parish was the center of a dispute with municipal authorities over the appropriation of land and a sham trial that convicted eight Catholics. In regard to the letter sent to the parish it is stated that "the archdiocese of Hanoi has always affirmed and supported the rights of property of the Redemptorist Order on 61,455 square meters of land" of the monastery and the parish, "including structures and area used by state agencies. "